1-Petroleum be completed and returned. 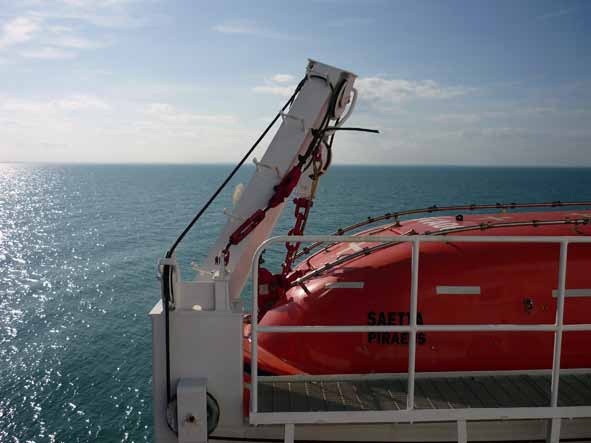 On 4 August 2009, completed checklists were received from both vessels and FCM notified the Maritime and Coastguard Agency (MCA) of its intention to conduct the transfer. The MCA advised that it would inspect Conger prior to the transfer. This was completed on 6 August, shortly after the vessel anchored off Southwold. On 7 August 2009, checklist number one from the STS Transfer Guide; ‘pre fixture information’, was completed by both vessels. The following day, Saetta carried out an STS transfer with the tanker New Challenge under the advisory control of a superintendent provided by FCM. The transfer was completed the next morning 8 August, and the vessels had separated by 1300. At 8 August 1430, Conger rendezvoused with the tug Flying Spindrift approximately 4.5 miles south south east of Lowestoft (see figure below). The superintendent, who had been on board New Challenge, and the fenders required for the STS operation, were then transferred from the tug to Conger. Under the control of the superintendent, the fenders were secured on the vessel’s port side. On completion, the superintendent met with the deck officers to discuss the impending transfer. Conger then headed to the south-east and rendezvoused with Saetta. Communications between the superintendent on board Conger and Saetta was by VHF radio, channel 73. Both tankers completed checklists 2 and 3 of the transfer guide, ‘before operations commence’ and ‘before run-in and mooring’ at 1710 (8 August). Conger then closed the starboard side of Saetta, which was maintaining a steady course and speed. By 1848, Conger had secured to the starboard side of Saetta using 6 headlines, two forward springs, two aft springs and four stern lines. As the vessels prepared for the cargo transfer, the superintendent ordered Saetta to manoeuvre toward the agreed STS transfer position and anchor 1 mile clear of other shipping. At 1954, Saetta’s port anchor was dropped in position 52° 11.8’N 001° 58.0’E (see figure above), and brought up with 7 shackles on deck. Checklist 4 of the transfer guide, ‘before cargo transfer’, was then completed on both vessels. Cargo transfer operations commenced at 2012 and were completed at 0948 the following morning. Following the transfer of the cargo, Saetta had a freeboard of 9m, and Conger had a freeboard of 14m. Shortly after cargo operations had finished, the superintendent passed a note to Saetta’s master apologising for the poor communications during the transfer with New Challenge. The note also explained his intentions for slipping the lines between Conger and Saetta, which were later reaffirmed during a face to face conversation over the bridge wings. At 1215 (9 August), a cargo surveyor on board Saetta called the superintendent and confirmed that the cargo operation was finished. Two minutes later, the superintendent advised Saetta that Conger was preparing her engines and that the unmooring operation would commence when her engines were ready. At 1235 (9 August), Saetta reported that her engine would be on standby in 1 minute, but was requested to wait 15 minutes. The superintendent also advised that he would let the master of Saetta know when to send his crew fore and aft to attend the moorings. At 1243, Conger’s main engine was tested ahead from the MCR and dead slow astern using the bridge telegraph. The engine started as intended on both occasions. Shortly afterwards, the superintendent briefed Conger’s deck officers on the intended sequence of events for slipping. On completion, Saetta commenced heaving in her anchor. At 1306, Saetta had finished heaving in her anchor. The superintendent’s plan was to manoeuvre from the anchorage and head in a north westerly direction, putting the wind on the port beam to help the vessels separate once all lines had been slipped. With the vessels now underway on a heading of 031°, the superintendent ordered Saetta to put her helm hard to port and her engine to dead slow ahead. He then explained to Saetta’s master over the radio that he intended to ‘single up as before’ referring to the recent separation from New Challenge, and advising that the last lines to be slipped would be two headlines from Conger and two stern lines from Saetta. At 1313 the vessels slowly turned to port, with their headings passing through 012° when speed through the water had increased to 2.3 knots (see figure below). The superintendent called Saetta and suggested that the time for completing transfer guide checklist 5 ‘before unmooring’ be recorded as 1310. This checklist included ‘The method of unberthing and of letting go moorings has been agreed with the other ship’. At 1316, Saetta’s heading was passing through 341° when the superintendent requested that she steady on a course of 330°. The unmooring operation commenced 2 minutes later. At 1319, Saetta’s engine was stopped and 6 minutes later her master reported that he had lost steerage with the ship’s head at 310°. More exchanges between the superintendent and the master of Saetta followed concerning which lines to slacken and slip. At 1327, the superintendent ordered Saetta ‘dead slow ahead’ and ‘steady’. At 1333 the number of mooring lines had now been reduced to two headlines and two stern lines and, the superintendent ordered Saetta to ‘stop engines’ and ‘wheel amidships’. Seconds later he ordered all lines fore and aft to be slipped simultaneously; the ships were on a heading of 303° at a speed of 2.4 knots. After the last lines had been slipped, the superintendent ordered Conger ‘starboard 5°’ and for the main engine to be put to ‘dead slow ahead’. Seconds later the engine was ordered to ‘stop’ and the helm increased to ‘starboard 10°’. Conger’s bow started to swing slowly to starboard, causing her stern to close towards Saetta. engine alarm was sounding and that the engine had failed to start. He then shouted to the master on the bridge wing to inform him of the situation. The ship’s officers spoke Ukrainian during these exchanges. The master quickly went inside the bridge and discussed the situation with the OOW. Meanwhile, the superintendent was aware that Conger was starting to fall astern of Saetta, and ordered ‘port 10°’ and the main engine to ‘slow ahead’. The helmsman applied the helm as ordered, but when the OOW placed the telegraph to slow ahead, the engine again did not start. The master returned to the bridge wing and advised the superintendent that ‘the engine not starting’. At the chief engineer’s request, the OOW put the engine telegraph to ‘stop’ followed by ‘dead slow ahead’. The main engine again failed to start. The telegraph was returned to ‘stop’ and the master ordered the OOW not to touch it. He also instructed the forward mooring team to leave the forecastle. 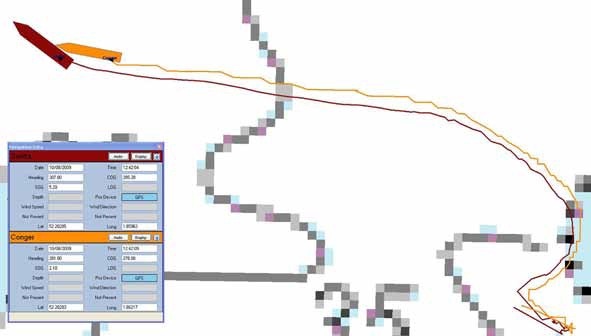 At 1337, the superintendent ordered Saetta ‘dead slow ahead’ and ‘easy to starboard’ to try and increase the lateral distance between the sterns of the vessels. In response, Saetta’s master used varying amounts of helm up to 30°. The superintendent also ordered Conger’s helm to ‘amidships’ to arrest the continuing slow swing to port. Seconds later, the superintendent broadcast on VHF radio ‘lost our engines we have lost our engines’. There were no ship names given before or after the message, and the bridge team on Saetta did not hear it. The superintendent then repeated his order for Saetta to proceed at ‘dead slow ahead’ and ‘easy starboard’. At 1338, the master asked the OOW what had happened to the engine. The OOW again telephoned the chief engineer in the ECR and was informed that the problem was being investigated. One minute later, the chief engineer called the bridge and asked for permission to test the engine. This was refused by the master. At 1340, Conger’s bow continued to swing extremely slowly towards Saetta and, the superintendent ordered ‘dead slow astern’. The engine telegraph was moved as instructed and the engine started. The superintendent immediately ordered ‘emergency full astern’, quickly followed by ‘stop’ ‘hard to starboard’ and ‘full ahead’. The OOW missed the final order, but immediately advised the superintendent ‘engine stopped’. The superintendent then ordered ‘slow ahead’ ‘full ahead’ ‘hard to starboard’ ‘stop’ and ‘full astern’ in less than 1 minute. Seconds later, at 1342, Conger’s port anchor struck the starboard lifeboat of Saetta, and her port bulwark hit the lifeboat davit arm. At impact, Conger’s heading was 289° and her speed was estimated to be less than 1 knot (see figure below). The superintendent quickly moved inside Conger’s bridge and ordered the main engine to ‘stop’ and the helm to ‘amidships’. Just prior to the collision, the superintendent had assessed that Saetta’s pivot point was forward of Conger’s bow, and ordered Saetta to ‘full ahead’ and ‘hard to starboard’ in an attempt to manoeuvre her clear. Saetta’s master remained unaware of Conger’s engine problems and had started to issue his own helm and engine orders to try and avoid a collision, but he had not informed the superintendent of his actions. The vessels soon separated and anchored close to the position of the collision. The superintendent reported the collision to Yarmouth coastguard. 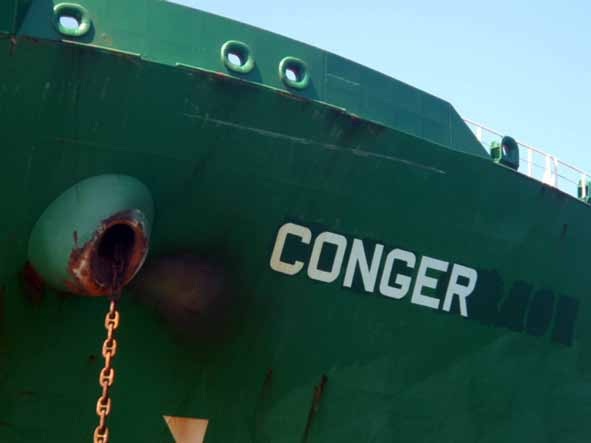 When Conger’s main engine failed to start when ordered ahead, there was no procedure in place for the crew to follow. This possibly led to the engine remaining stopped for about 4.5 minutes. Prompt and effective action following the loss of Conger’s main engine was hindered by two significant breakdowns in communications. It is essential during STS operations, that account is taken of the language and communication channels to be used and the roles of the persons involved when determining the composition and organisation of bridge teams. The unmooring operation and departure manoeuvre was not properly planned or briefed, and there was an over-reliance on checklists. The provision of operational standards for service providers would help to simplify the vetting process for the oil majors and would provide service providers with a benchmark. The service provider had not taken any steps to monitor the hours of work and rest of its superintendents, or assessed the superintendent’s performance annually as suggested in the STS transfer guide. The responsibilities of a superintendent in STS operations are wide-ranging, time-consuming, and demanding, and vary according to the type of transfer conducted. The risk of overload could be reduced by the provision of a second superintendent or an assistant. There are no occupational standards defined for superintendents or masters in control of STS operations. 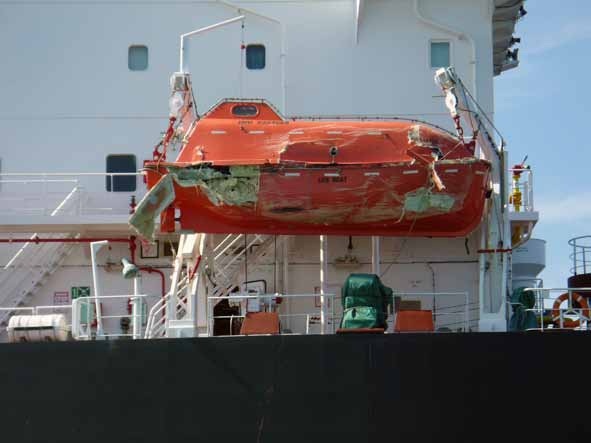 It is important that the ICS / OCIMF STS Transfer Guide (Petroleum) is reviewed and amended to fully reflect current operations worldwide and to take into account the lessons learned from this and other recent accidents. Saetta’s operator carried out an investigation into the accident, the report of which identified poor communications as a contributory factor. The company has revised its STS operations procedures to include the requirement for an additional officer to be present on the bridge. The officer will be in charge of the communications between the bridge team and the superintendent while the vessel is manoeuvring during STS operations. Defined STS weather parameters above which the operation should be aborted. Ensuring crew and the mooring master (aka superintendent) have adequate rest prior to the mooring and unmooring. Mooring master orders must be assessed and evaluated before they are followed by the master. Mooring masters’ qualifications and physical condition to be verified prior to commencement of the operation. Mooring and unmooring operations should be carried out underway if a tug is not available. A contingency plan for the loss of propulsion during an STS transfer has been forwarded to its fleet. 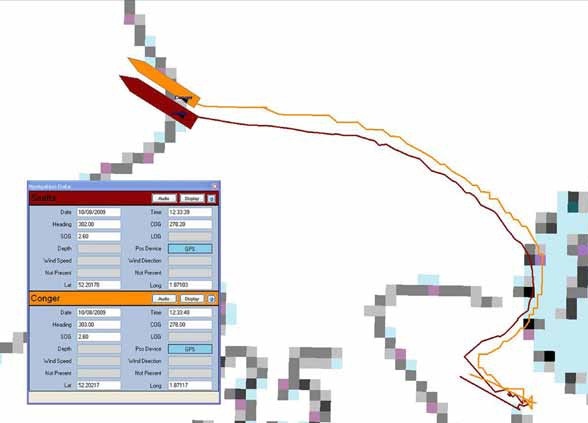 The plan includes the standard actions in the event of an engine failure and the need for good communications arrangements between masters and mooring masters. 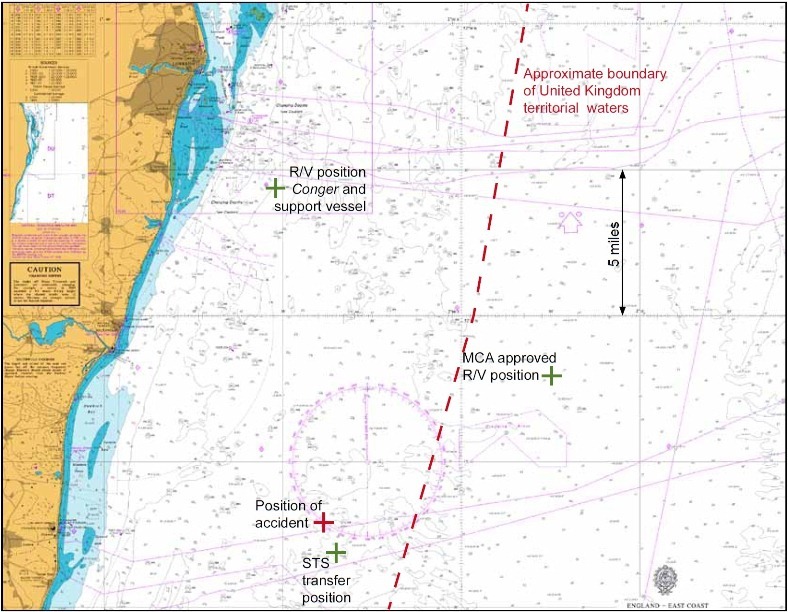 Revised STS instructions now prohibit vessels from manoeuvring or berthing operations after sunset, and recognise that tug assistance may be required. A ‘lessons learnt’ memorandum has been circulated to its fleet. A marine superintendent to provide marine support to the operations team, including advising on the suitability of vessels to conduct a transfer.